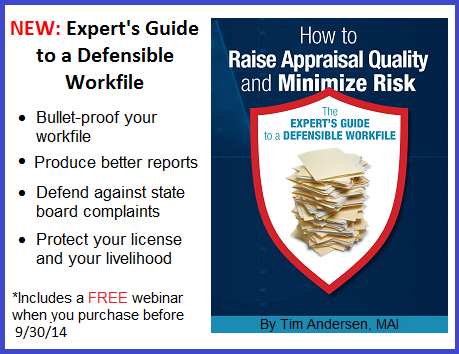 The new 2014 Expert’s Guide to a Defensible Workfile shows you how to “bulletproof” your workfile and protect your appraisal license and livelihood. Produce better reports: Click here to learn more. 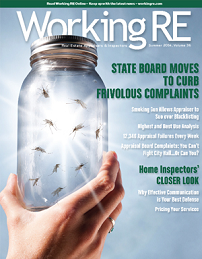 >Want to be a better FHA Appraiser? The FHA Checklist and eBook keeps you up-to-date on FHA requirements, helps you be more efficient on FHA Inspections and keeps you off their “do not use” list. Click here to learn more. 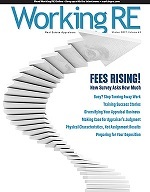 Regulations state that appraisal adjustments cannot be based upon an appraiser’s opinion. According to federal and state law, adjustments must be based on support and evidence- proof if you will, and an appraiser’s opinion is not considered to be “support.” Many appraisers have failed to support their adjustments and as a result have had their licenses revoked, penalties assessed and lawsuits lost, all because the they failed to understand a single but important requirement. Think about your appraisals. Are the adjustments based on your opinion or do you have proof of the adjustment in your workfile? If your workfiles are reviewed by the state or as part of an investigation or lawsuit, would you have “the right stuff” or fail the test? Then one day I was appraising a multi-million dollar waterfront home and that trusty, crusty old “sheet of adjustments” just didn’t make sense. People would spend $20,000 for new carpet so a $2,500 adjustment for a bedroom wasn’t cutting it. Ends up that the person who trained me, along with that “sheet of adjustments” were worthless. My solution was to take a class on adjustments from the Appraisal Institute as well as reaching out and learning from good appraisers. What I learned was like a ray of sunshine from above. And the funny thing is that the Uniform Standards of Professional Appraisal Practice (USPAP) had laid out the requirements for years…..I just didn’t get it….not at first. • and my favorite – Hagar’s Percentage of Use Calculation. Email isaac@orep.org for your invitation. >Seating is limited, Reserve your seat today! >2014 IRS Valuation Summit – Are you attending? This business is in rapid decline. There are no more trainees for a reason. Technology is fazing much of it out quickly. The state can do whatever it wants if a complaint is filed against you.